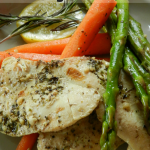 A wonderful combination of lemon, butter, chicken, asparagus and carrots. So quick to make and such great flavor. All will enjoy and cleanup is a breeze. Melt butter in your favorite sauté pan over medium heat. Add garlic, Italian seasoning and salt and pepper. Sauté for about one minute. Add your chicken to the pan and cook for about 5-7 minutes then turn chicken and cook the other side for another 5-7 minutes. At this time chicken should be mostly, but not all the way cooked through. In a small bowl, mix lemon juice, honey and soy sauce. Pour over chicken and vegetables and cover pan. Cook for about 5-7 minutes or until chicken is cooked through and vegetables are tender. Serve with fresh garnish or lemon wedges if desired.